"There is probably little I can say, other than expressing my belief that this will be a great and popular film. I feel that Pirates of Silicon Valley was more interesting and grabbing and gets more play in schools of all levels than The Social Network. My hopes are that this film turns out as truthful and genuine as possible. I can't judge that aspect until the film is done and I see it. As to the role of Steve Jobs I have little to say. Everyone has their own idea of who they think could play Steve the best. But when we started Apple at our young ages I decided not to put my nose and comments into every aspect of the company, like the color of boxes or the job responsibilities for a team. I would not step on the toes of people who had done these jobs for many years or decades. I would just do my engineering where I could not fail. So I look at the casting agencies and directors who are experts at casting. i trust that they considered all the relevant factors and made the best selection. The fear that many might have is that Ashton was selected because he's 'hot' right now. But I feel that his selection was done in the most professional manner. And I'm glad that he's onboard. I think he'll put a lot into it and that he cares about this particular subject. 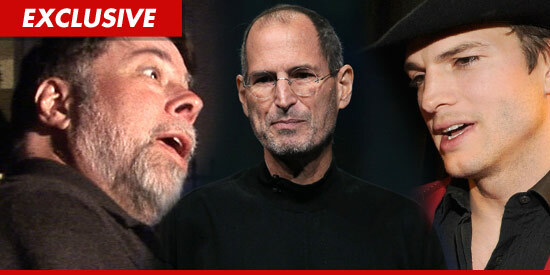 It's almost too bad that Steve Jobs is gone. His opinions and guidance, as to the story and film crew and cast would have been invaluable."